The Banana Pi is an ARM powered mini-computer inspired by the Raspberry Pi. 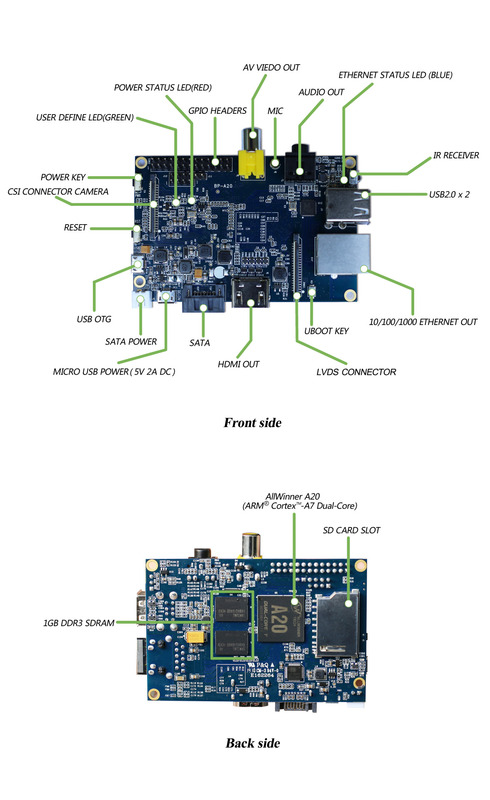 The Banana Pi has a 1GHz dual core processor with 1GB of DDR3 RAM. It has a gigabit ethernet socket, and an on board SATA connector. Several Linux distributions are available including Raspbian and Ubuntu. 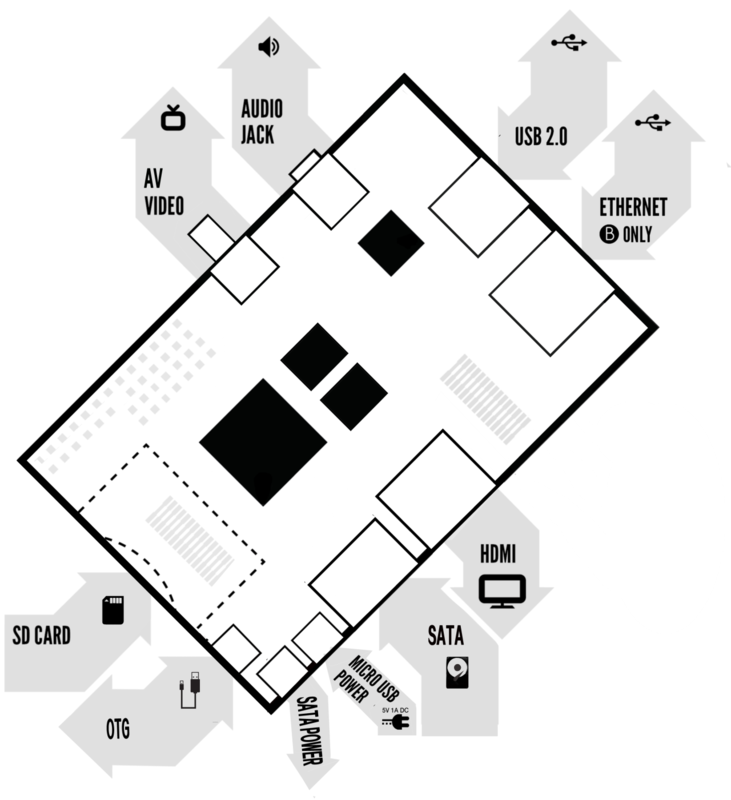 This site is hosted on a Banana Pi cluster which also hosts Linux Web Servers and Pyplate. The Banana Pi was developed by LeMaker in Shenzhen in China. It is an open source platform intended mainly for educational uses. LeMaker are committed to the open source philosophy and sharing with the Linux community. Installing Linux on a SATA hard disk will allow Linux to run faster, and increase the amount of storage on your system. I powered my SATA disk using a separate power supply (I don't have a cable that matches the Banana Pi's SATA power socket). Set up Raspbian on an SD card as described in this post on /set-up-linux.html setting up Linux on a Banana Pi, but don't install updates. Connect your disk to the Banana Pi's SATA socket, but don't power up the disk. Power up the SATA disk, and look for the new drive in the messages in the terminal. If the drive is auto-mounted when you connect it, unmount it. Fdisk will automatically quit. Restart fdisk so that you can create a partition, and type 'n' to create a new partition. When prompted for the type, press 'p' for primary, and enter '1' for the partition number. Just press return to use the default values when prompted to enter the first and last sectors. Type 'w' to write the changes to the disk again. Mount the partition, and use rsync to copy the contents of the SD card's root directory to the SATA disk. Finally, restart your server. When it starts up again, it should use the hard disk as the root file system. There are a number of settings which people often change when they have just installed Linux. If you are using your Banana Pi as a server, you may not need to use the Lightdm desktop environment, and just let your Banana Pi boot to a command line interface. Many Linux images have a default username and password. The default username and password for the Raspbian image are 'pi' and 'bananapi' (in many of the Banana Pi Linux distributions, the default username is bananapi). It's best to change these login details so that no one else can log into your Pi. You need to configure your Pi to boot to a command line - the following procedure won't work if you're logged into a desktop session. Once you've booted to a command line, you need to change the shell session to the root user. This is necessary because you can't modify a user account while you're logged in as that user. When you reboot, you'll need to log in using the new user name. You will be prompted to enter your current password, followed by your new password twice. The hostname is set in /etc/hostname. This file only contains the hostname. Open it as root, and change the name. I've change it from 'lemaker' to 'bpi'. Look for an entry with IP address 127.0.1.1, and change the host name as required. Reboot your Banana Pi, and you should see that its host name has changed. If you're using a version of Linux installed from an image, the image may already contain keys. These keys are the same for anyone who's installed the same image, so it's important to change them. A new set of ssh keys will be generated in /etc/ssh. Users can generate ssh keys for themselves so that they can easily authenticate with ssh servers on other hosts. Using keys means users can be identified by their keys without needing to type a password. You'll be prompted for a place to save the keys. Just press return to use the default location. This will create a pair of RSA key files in ~/.ssh/. It's necessary to type a password the first time the connection is made, but after that it's possible to connect to this device without typing a password. Most of the Linux distributions available for the Banana Pi can be downloaded as a disk image from Lemaker's web site. Most of these images take up 4GB when unpacked and copied to an SD card. There's a small Fat16 partition used for storing boot files, and a 3.7GB ext4 partition for storing the root file system. When you install updates on a new disk image, you may find that the Linux partition fills up before all the updates have installed. It's a good idea to use an 8GB card (or larger), and resize the partition so that it fills the entire card. If there's any important data on your SD card, you should back it up before you make any changes. The card shouldn't be mounted while you resize it, so you need to put it in an SD card reader and plug it in to a Linux PC. If you have a spare SD card, you can boot a Banana Pi with one SD card, and use it to resize the Linux partition on a second SD card. Fdisk will display a prompt where you can enter simple commands. You're going to need to delete the second partition, create a new larger one, and write the changes to disk. The partition table will be updated, but the data in the partition will be untouched. When you create the new partition you'll be prompted for a type, primary or extended. Type 'p' for primary, and enter '2' when prompted for the partition number. When prompted for the first and last sector numbers, just press enter to use the default values selected by fdisk. The next step is to type 'w' to write the changes to the card. Fdisk will automatically quit after this. Welcome to fdisk (util-linux 2.24.2). Resizing the filesystem on /dev/sda2 to 1939712 (4k) blocks. The filesystem on /dev/sda2 is now 1939712 blocks long. The partition and its file system should now occupy the whole SD card. Some Linux distributions are supplied with a graphical tool called Gparted, which is available in the Fedora image for the Banana Pi. It's available on many PC Linux distributions by default. If you're using Fedora on your Banana Pi, you can use Gparted instead of fdisk. Before you start, make sure the card is plugged into an SD card reader, and make sure the card isn't automatically mounted. Launch Gparted by going to the Application Menu -> System -> Gparted. Select the card that you want to edit from the drop down menu on the right hand side of the tool bar. In this case it's /dev/sda. Click on the partition /dev/sda2, go to the Partition menu, and select Resize/Move. In the resize window, drag the right hand edge of the partition as far to the right as it will go, and click on the Resize button. Click the Apply button on the Gparted tool bar to write the changes to the card. The partition will be enlarged, and the file system is automatically expanded to fill the partition.